Hi everyone. 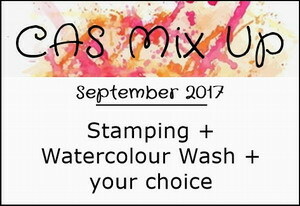 Welcome to the launch of the September CAS Mix Up Challenge. This month the challenge is hosted by Bonnie. Playing with re-inkers to make this card. I placed a drop or two of red and brown distress inks on my palette, diluting with a bit of water. Then used a round brush to add clear water to my mixed media card front. I picked up red ink with my brush and just made some loose brush marks across my card front. Rinsed out my brush and picked up the brown and added strokes of brown, making sure to overlap the red. That's it. Let it dry and added a simple black stamped sentiment and black silhouette flower die-cut that I shaped with my stylus. Check out the CAS Mix Up Challenge blog to see the amazing cards from our talented Design Team and wonderful Guest Designer, Cathy (Cathy's Card Spot). CAS creative artsy Perfection my friend. 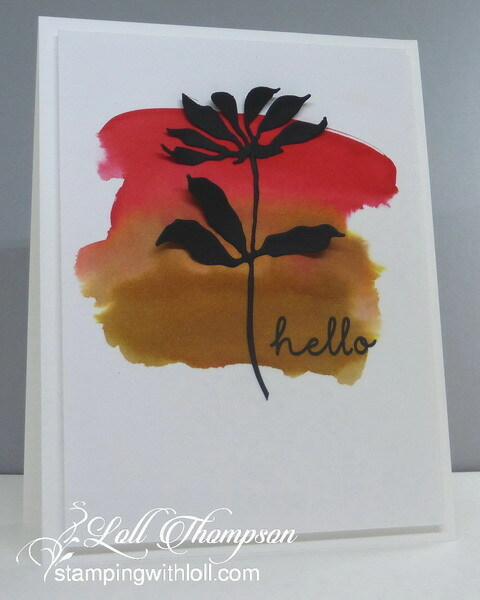 I love your color choices for your watercolor wash and your die cut and shaped silhouette flower. TFS Loll. Hugs.. I always am happy to see that I have an email from you! It is like opening a surprise package of goodness. Today was no exception. love this, Loll - will have to give it a try - looks pretty easy!! Wonderful wash of two beautiful autumn colours! Perfect backdrop for your silhouette! Striking card! Eases us in to look of fall colors and makes that silouette die absolutely pop. Really like the fall feel on this card. It's very striking with the black flower that pops so prettily. Great card! :) Hugs! So easy with such an impact! The colors are wonderfully fall and so vibrant. I simply love this card. I am not brave enough to use these bold colours together because I would just produce mud. Great card. Beautiful autumn color palette for your watercolor wash, Loll, and I love that you chose black for your bloom...it really pops against your background! Really pretty card! Bold and beautiful, my friend! Love that die cut in black! It makes a stunning card! 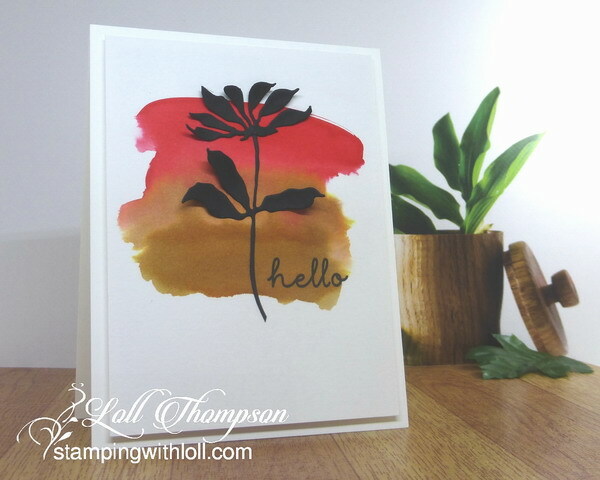 This is one of my favorite color combinations and love the beautiful wash you created behind your die cut. Your CAS designs are fabulous, Loll! I'd hate missing seeing them! Your background is really amazing, Loll. Surprisingly, the combination of these colors gave such a beautiful effect. This is a true color mixing mastery, so as not to get ugly dirty brown. You have managed to create a beautiful colored autumn background. Black flower beautifully constricts. So simple yet so striking, Loll.